We have secured a major listing for JUST Water as the sustainable water brand launches in PureGym sites, marking its first UK gym listing. With over 200 sites nationwide, PureGym is the UK’s leading gym chain and provides flexible and affordable access to high-quality fitness facilities. As part of its focus on innovation, PureGym aligns with unique food and drink brands to help gym-goers achieve their health & fitness goals, with products available in vending machines across all sites. The JUST Water bottle is comprised of 82% plant-based, renewable materials and is recyclable. The cap and shoulder of each bottle is made from a bio-plastic that originates as sugarcane; the bottle itself is mostly paper made of trees from sustainably managed forests. It can be recycled kerbside and at bring-bank locations in most UK communities. Clark McIlroy, managing director at Red Star Brands, said: “JUST Water has made a real impact since it launched in the UK last month and we are excited to see demand for the brand grow. Consumers are becoming increasingly aware of their plastic consumption and the alternative packaging solutions which are now available thanks to brands like JUST Water. 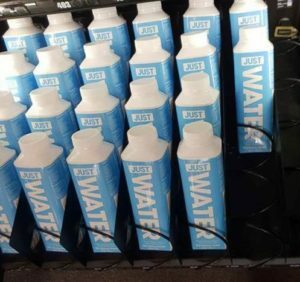 Launched to the UK market in August, JUST Water is now available in PureGym locations, 800 Boots stores nationwide and all Whole Foods Market locations in the UK.